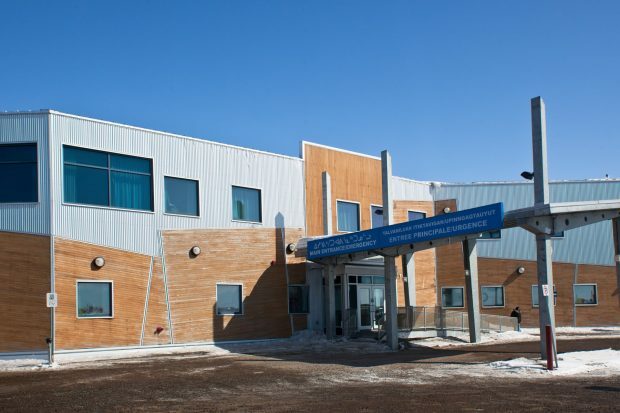 QGH is a 25-bed acute care facility serving the approximately 16,000 people living in the Qikiqtani (Baffin) Region, which is home to twelve communities spread over approximately one million square kilometres. 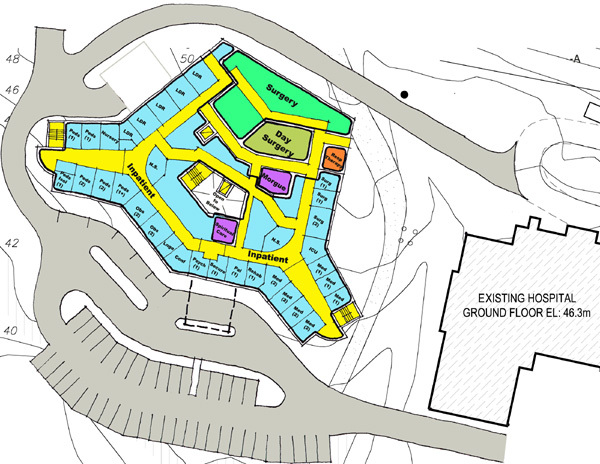 The new hospital, adjacent and linked to the Baffin Regional Hospital in Iqaluit provides emergency services, diagnostic imaging and lab services, surgical department, med/surg, obstetrics, paediatrics, maternity and critical care inpatient units as well as sterile processing, outpatient and public health educational facilities. Acting as the community heart of the building, the central two-storey lobby/atrium serves as the major point of orientation for patients, families and staff to access all areas of the facility, creates a canvas upon which to express community and cultural values and allows borrowed daylight to penetrate into adjacent internal spaces of the facility. The atrium space is easily visible upon entry and flanked by public amenities, such as an information desk, gift shop and coffee shop, to contribute to its liveliness. Wayfinding opportunities are optimized, and patients and visitors are easily oriented as they enter into a space that is comfortable, assuring and welcoming, while the public elevator and stair located within the atrium provide highly visible and accessible vertical circulation. From the atrium hub, the clinical spaces radiate outward providing efficiency of circulation and supervision, while setting up a rational progression from public, to semi-private, to private/secure areas of the facility. On the upper floor, horizontal circulation is designed to simplify wayfinding to areas accessed by the public, including the various inpatient unit functions, day surgery and respiratory therapy. A restricted corridor allows discrete transfer of patients from the emergency department to the surgical suites. 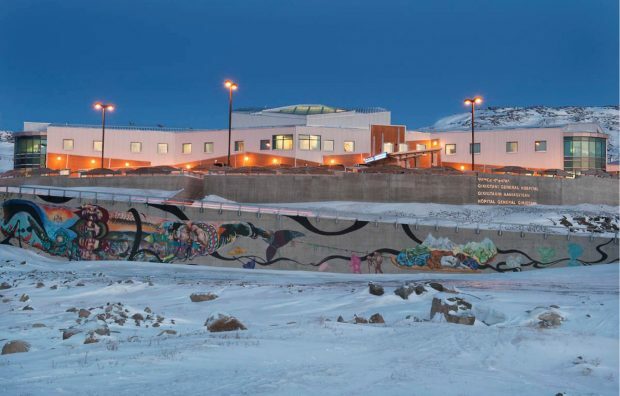 As the only hospital in Nunavut, this project provides expanded and enhanced healthcare facilities to serve the growing population and evolving health needs of the Territory. 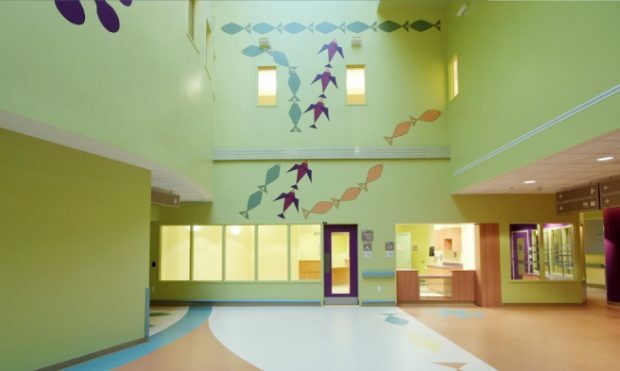 The design team (FSC, now Stantec, and Nycum) worked closely with the GN and stakeholders to create functional, productive, and interactive spaces while helping to minimize disturbance and confusion often associated with hospital visits and stays. The rational layout provides clear wayfinding, while optimizing supervision and sightlines, and clearly separates public, semi-public and secure areas of the facility.